Our Website has been upgraded to service you better! Same parts and service. Thank you for visiting TroyBiltPartsOnline.com. 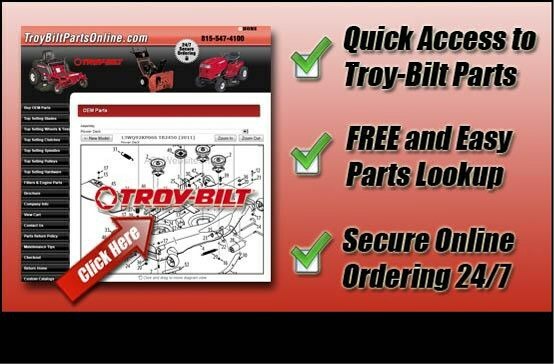 Our goal is to get you the Troy-Bilt parts you need as quickly as possible. Our parts diagrams are easy to use. Our popular parts catalogs show parts photos for your selection. Simply find your model, choose the part section you are interested in, and then click and choose the parts you need. Can't find what you need? Click the Question Button on the left to contact us. We are waiting to assist you! For years the Troy-Bilt name has been legendary in the garden tiller equipment market. Cast iron transmissions, simple easy to maintain linkage and construction, and high performance has made Troy-Bilt a household name. Today there are also push mowers, self-propelled mowers, riding mowers, log splitters, snow blowers, pressure washers, generators and many more products that proudly wear the Troy-Bilt name. As with all high quality outdoor power equipment, proper maintenance and original equipment factory sourced parts are essential to maintaining the condition and performance of your Troy-Bilt equipment. 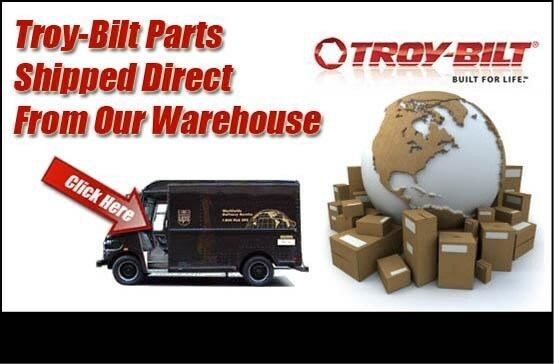 Good equipment deserves good parts and TroyBiltPartsOnline.com maintains a huge inventory of Genuine Troy-Bilt parts to keep your equipment in great condition. We offer cheap shipping rates and quick service to help keep your equipment in good running order.